When I was 15 years old, I started my first business. It was a recording studio in the basement of my parents house. I would record these terrible metal and punk rock bands for $10-20 per song. While I didn’t pursue audio as my career long term, I discovered something very important in that basement. My passion is creating media and sharing it with the world. The fact that as one person, I had the ability to create a piece of media, and then that media could be duplicated and shared with hundreds, thousands or even millions of people became my passion. That media could be used to entertain, inspire or educate others. What I didn’t realize at this time is what I was really growing to love was not just the creation of the media, but the marketing of the media. I became obsessed with building the brand for my first company, even at that young age of 15. I became obsessed with building my Myspace page (Yes, myspace was still cool then) and reaching out to other local bands about recording them. I became obsessed with the marketing. That obsession with marketing is what helped grow that very first company from the recording studio in my parents basement into a leader in the media production industry. Regardless of if you are an entrepreneur, a creative professional, or even an employee of another company, you need to learn marketing. Marketing is not your logo, your brand, or your slogan. Marketing is what you are selling and how it is positioned. Marketing is how people perceive you and your personal brand. Marketing is the single most important part of any business or personal brand. Marketing is NOT Facebook advertising, social media, or SEO. Marketing is about crafting a genuine story, and then sharing that story with the world. This is the core of marketing and where many people mess the whole thing up. They create a company name, throw up a logo, a website and some social media accounts and expect people to start hiring them. That may have worked years ago, but it doesn’t work today. You have to tell a story, and people then have to believe that story. He argues that when you get past the commodity level and you are trying to sell something that is not just a need, but is a want, then it is all about the story. There is a coffee shop in Nashville called The Frothy Monkey. Anyone who has ever been there knows it is outrageously overpriced food and coffee. Yet, within a 5 minute walk in any direction you can get to multiple other coffee shops that sell coffee and food for half the price. So why is it that The Frothy Monkey is so successful? It tells a story with where it is located, by sharing a patio with a high end boutique clothing store. It tells a story with how their staff treats you, always giving you friendly and personalized service. It tells a story with the cleanliness of their bathroom, and quality wood of the tables you sit at. Everything about the experience of The Frothy Monkey is an experience, and when you spend $20 on a cup of coffee and lunch there, it makes you feel good. It makes you feel upper class because you could afford this luxury and you are a member of this tribe of others who can afford it as well. Every single one of us tells our own story. We decide if we want to be the cheap coffee shop down the street, or the high end luxury experience. But in order to do that we have to be intentional. Over the next quarter, I will be writing more on the topics of marketing and personal branding. It is truly a passion of mine, it is something I love and I am excited to share it with the world. My hopes are that these writings will educate, inspire and entertain you. As I said before, I truly believe everyone needs to learn marketing today. You are at minimum a marketer of yourself. I mentioned Seth Godin’s book earlier and I cannot praise him enough. His writing on the changing role of marketing is truly incredible. 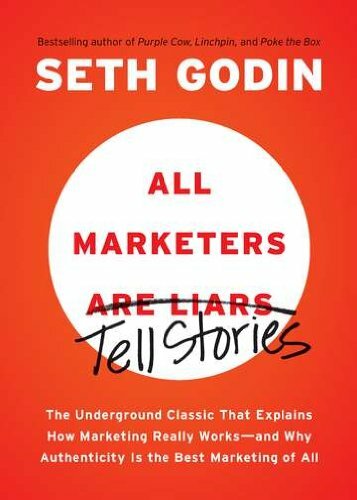 I would highly recommend his book All Marketers or Liars. It will fundamentally change how you look at marketing. I would also recommend Seth's Skillshare class The Modern Marketing Workshop. If you have never used Skillshare before and you use the promocode 'seth2014' then you can get Seth's whole class for about $6. It is definitely worth the small investment. I can’t recommend Seth’s teachings enough and I truly believe that what he is writing is valuable for any entrepreneur or creator today. Or, if you don't have the time to learn feel free to reach out to me through my consulting page and I will be happy to help you share your story.